With the hot weather already making an appearance this year, people are clamoring for a cool place to go. If you’re lucky, you may already have one right under your nose. Often viewed as a musty place where spiders wait in ambush, basements are naturally the coolest place in the house due to their earthen insulation. The cinderblock walls and criss-crossing ductwork don’t make for the most appealing place to spend a few hours, though. 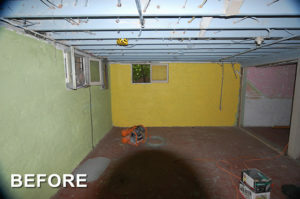 Why not spruce the place up with a basement remodel? When the mercury starts inching towards 90 degrees (and beyond), you’ll have a ready-made cooling down station. If your basement does have a dank feeling to it, look for any signs of water issues. Small pools of water or discoloration on the walls can lead to bigger problems if you decide to frame out your basement. Make sure the ground outside is sloping away from your house to prevent water from pooling in one area, then seeping through your basement walls. Have the foundation inspected to make sure any cracks can be fixed or mitigated to insure your basement remodel stays dry even during the rainiest of days. Now you’re ready to start planning your basement remodel layout. Where does the television go? Do you want to have a small refrigerator in the basement? Maybe installing a bathroom will make your retreat complete. Make sure to get all the proper permitting for the job, especially if you want to install new electrical wiring or water/waste lines. Have a contractor look over your plans – having a wet bar in the basement may be your idea of paradise, but if it becomes cost prohibitive, you’ll want to know before you start. Framing out the basement will allow you to add walls to separate the area or make a guest bedroom, run water to a sink or washroom, and provide a more welcoming place to gather. Inserting a vapor barrier between the framing and the foundation will also provide another layer of moisture protection. Insulating the framed walls will help to keep things cool in the summer and warm in the winter. Don’t forget about the ceiling. Can lights are optimal for a basement area because no headroom is lost. If there is room, consider a drop ceiling to allow for easy access to the wiring, pipes, and ductwork already in place. At this point, the basement remodel will begin to look more like an inviting getaway and less like a breeding ground for old holiday decorations. Not to mention the amount of finished square footage you’ve added to the house. And, of course, a cool place to go down to when the temperatures go up. 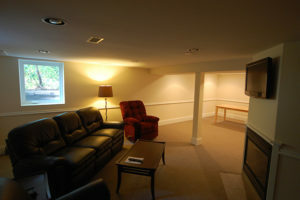 Tell us about your basement remodeling project today!